Forward head posture is endemic to our society. It is a type of bad posture usually caused by too much sitting and misalignment in the pelvis which can cause a chain reaction of muscle and tissue imbalances that make the head go forward. Typically the muscles complaining in pain in forwarding head posture are the overworked posterior muscles of the neck, which serve to extend, rotate, and laterally bend the head. The forward head carriage can lead to many problems including chronic pain, headaches, numbness from nerve compression, and difficulty with breathing correctly. Spending long periods of time with a head forward posture can cause muscle imbalances in the neck and back that do not occur naturally. Seen standing upright from the side someone with perfect posture would have an imaginary center of gravity line running from just in front of their ear hole through the slight bump on the top-middle of their shoulder. The key cause is computer use, especially laptops and smartphones. Carrying heavy bags or back packs, lazy posture and television time with little or no exercise also don’t help but it is the eight hours a day for 30 years that really does the trick especially if it starts when you are young – say in your teens. 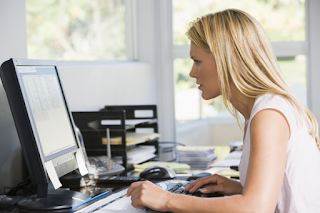 Computer work keeps you in a static position (usually a forward curved position as well) for long periods of time, which is why getting up and moving around every 15-20 minutes will help. Read more here. Forward Head Posture can cause serious health problems if left untreated. Anyone suffering from forwarding head posture will know how difficult this can be. Why untreated forward head posture is like a ticking time bomb for your overall health and why you need to act NOW before the damage becomes irreversible (you really could be days away from causing irreparable harm to your body). – For every one inch the head sits forward of the shoulders, an additional 15-30 pounds of tension is placed on the muscles in the back of the neck. 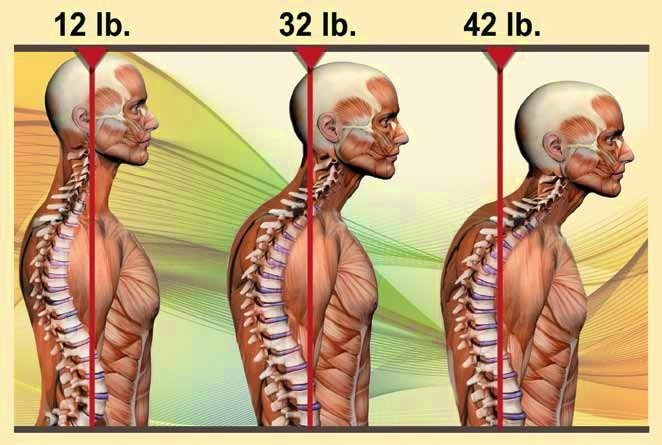 – It has been estimated that a person with Forward Head Posture uses 30% more body energy to keep the body erect. – As the body shifts, certain muscle groups get stretched and become weak, and other groups shorten, and become weak. This results in degenerative changes that twist and distort the spine and subsequently shorter stature. See more here. It’s impossible to tell what’s causing your posture without examining you but generally, people with forwarding head posture have tight pecs, upper traps, levator scapulae, and scalenes. Lack of cervical curve and forward head posture is at epidemic levels that have gained the attention and evaluation of more than just chiropractors. What are treatments for Forward Head Posture? Conventional medical treatments help relieve the symptoms of Forward Head Posture but they do not address the root cause of the problem. Traditional treatments include the use of over the counter medications, prescription medications, steroid injections and physical therapy. Physical therapy or the strengthening of the functional weaknesses in the back, can help to alleviate postural problems. However, true correction can only occur when both the structure (spine alignment) and function (muscular weakness and imbalances) have been restored. Think Corrective Chiropractic may be for you? Read more. Seek Professional Help Now Before It Gets Worst! To manage symptoms associated with cervical radiculopathy, non-surgical treatment plans to correct forward head posture are considered clinically effective. However, static stretching only provides temporary relief in pain, muscle tension and an increase in movement but within a few hours, your forward head posture is back to the way it was since the stretch did not target the main cause of your head forward posture. If you are experiencing forward head carriage that needs immediate correction, Calls us today (619) 831-8777, we are here to help you.